EquipHotel Paris, one of the largest events dedicated to the hotel and restaurant business, is about to make its return to the city of lights. Starting this Sunday and running until the 15th of November, the event will bring a new light and perspective to these industries. One of the sectors that will actually be featured during the event will be the bathroom sector, and the Luxury Bathrooms blog knows just the right brand for visitors to go take a look … Maison Valentina. We had previously mentioned 10 bathroom products that one should take a look but now we will give a special focus to the renowned Portuguese bathroom brand that will showcase a series of bathroom furniture and accessories that are the epitome of glamour and luxury living. Maison Valentina will share a booth with its sister brands, Brabbu and Luxxu, located at Pav. 2.2 – Stand C084. The designs of each of these brands authentically reflect innovative design, craftsmanship, and above all, high-quality. But focusing on Maison Valentina, you can expect to see a few pleasant surprises from the brand, including the Symphony freestanding, the Diamond Towel Rack and the Colosseum mirror. Symphony draws inspiration from music, being wrapped by a polished brass tubular structure that resembles the organ tubes. This freestanding is handcrafted with the finest materials: it sits on a high gloss black varnish base and to complement. The sink is made of Nero Marquina marble, giving it a genuine style, ensuring mystery and elegance in any luxury bathroom. 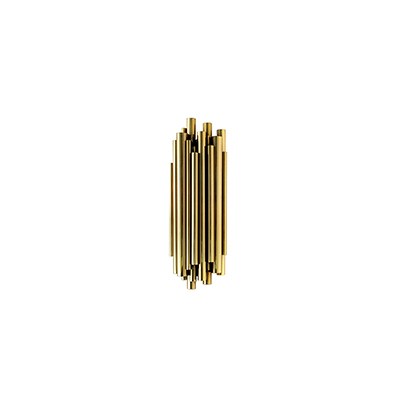 Dimensions: Diameter: 42 cm | 16,53" Height: 87 cm | 34,25"
Diamond is a 3 tier towel rack produced in polished brass. It is supported by a diamond shaped base built in Nero Marquina marble. Enhance your bathroom decor with this sleek and contemporary design piece produced with attractive high-end finishes. Dimensions: Width/Length: 54.5 cm | 21.45" Depth: 17 cm | 6.69" Height: 123 cm | 48.42"
Colosseum is a rounded oblong mirror inspired in the most iconic buildings from Ancient Rome, because of its massive size and concentric shape. It features a frame produced in polished brass accented by an LED strip around the whole body. Dimensions: Width: 100 cm | 39,37" Depth: 5,7 cm | 2,24" Height: 210 cm | 82,67"
As a whole, the finest bathroom details for the hospitality industry will be shown at EquipHotel Paris, so don’t miss this opportunity to discover the latest trends and news in this thrilling industry.